We Provide Tuition for 11th 12th Science + MH-CET/ NEET. We are providing unmatched guidance from the last 49 years. We are located at Andheri (east and west) , KandivalI , Borivali (east and west) and Dahisar. 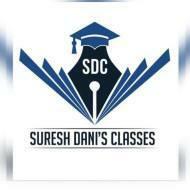 Sureshdani's Classes conducts classes in CET Coaching, Class 11 Tuition and Class 12 Tuition. It is located in Borivali East, Mumbai. It takes Regular Classes- at the Institute.